April – I love it, I want it! This is getting good right so many blog post’s from Kiran. This can only mean one thing…my GCSE’s are getting closer *cries*. I decided to post a few posts together as you have something to read. As my GSCE’s are round the corner I need to revise most of the time..meaning I won’t be able to blog. However, this will only be for around 5-6 weeks then I’ll be back with lots of exciting post for you guys – trust me when I say exciting I mean real exciting!! This is not my last post I’ve got 2 more I think then I’m going to have a break – but as always thanks for the support and I love all you guys. So today, I’ve got my April – I love it, I want it! 1. Floral print shell top – Missguided. – This top is one of them items that some people love and someone people hate and for me it was love love love! 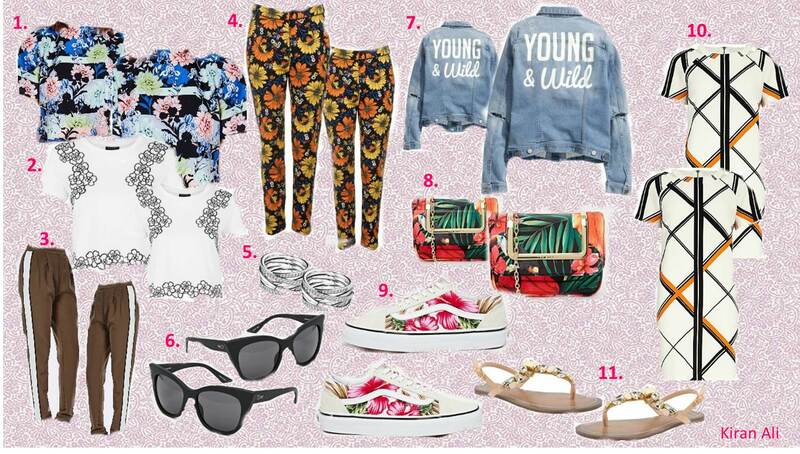 I just think the floral print is perfect for spring/summer!! 2. Daisy cropped tee -Topshop. – I have seen so many people wearing crop tops like these..which makes me really want to have one in my wardrobe it would just look super cute in summer with some printed leggings. 3. White stripe khaki jogger – Missguided. – I fell in love with these instantly. Missguided have got to have some of the best spring/summer clothing the whole collection is just so beautiful. So definitely check their spring/summer collection out guys. 4. Daisy print trousers – Topshop. – I saw Zoella trying these on in one of her vlogs and they just looked so pretty. I really want them – even though they’re probably sold out because they were so popular. 5. Silver rings – Pandora. – Lately I have had an obsession for rings and these I just think would look good with anything and everything!! 6. Quay cat eye sunglasses – ASOS. – I saw velvetgh0st wearing a similar pair of sunglasses in one of her videos and I just wanted them from that moment on. Guys I really need them. 7. Denim jacket with print – H&M. – I think a denim jacket is a need when it comes to spring/summer. As if its a bit breezy and your wearing a sleeveless top you need a little jacket – this is the one. As you still look sassy even with a little denim. 8. Ted Baker tropical body bag – ASOS. – This little body bag just ticked all the boxes for me. The colours, the shape and the size. All just so perfect for summer as you don’t want to be carrying a massive bag. It’s just all round perfect. 9. White floral old skool Vans – ASOS. – As you all know I have an obsession for Vans. These Vans were just so tropical and summery that I want them more than anything right now. They’d look super cute with anything bright. 10. Orange cut out net shift dress -River Island. – Again the bright orange just does it for me. The classy white and orange just compliment each other so well that you can’t go wrong at all wearing this. 11. Valentia flat sandals – Brantano. – These sandals would look super chic with the white dress above as the colours go well with each other and make a perfect outfit – a bit of sparkle and vibrant colours. Zoella really pulled off a whole outfit with those trousers. I just wish they would suit me!